I am very pleased to welcome onto my blog author Regina Jeffers. Regina is a resident of North Carolina, USA, a teacher and a Jane Austen enthusiast. This love of the English author has lead her to writing several Jane Austen adaptations and sequels, Regency Romances and contemporary romances, novels include: The Disappearance of Georgiana Darcy, The Scandal of Lady Eleanor, A Touch of Velvet and Honor and Hope to name a few . Regina’s blog can be read here. ‘The graceful style for women of the early 19th Century is known as the Empire style. Tightly laced corsets were overthrown for the more natural flowing gown. 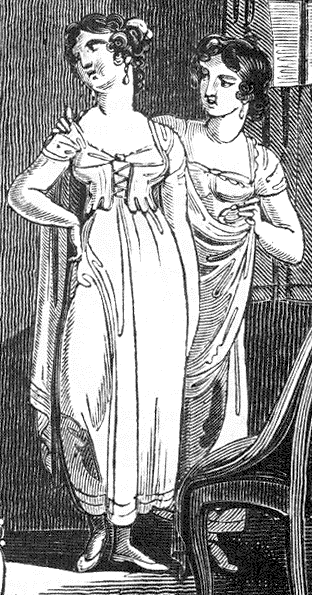 By the end of the 1790s, the Empire cut, which had begun as a chemise shift that was gathered under the breasts, was the accepted form of dress for ladies. Originally, the bustline was drawn together with a girdle. By 1800, the gown had a very low square neckline, which exposed the woman’s décolleté. The barely-there puff sleeve was pulled back by the short narrow backed bodice, which greatly restricted a woman’s arm movement. The dress was regularly made of fine white muslin or batiste. Different colored clothing were used for riding, morning calls, and evening suppers. Pale colors were prevalent. It would be rare to find a pattern in the gown. Muslin gathered with less puckering and was the material of choice, but it was difficult to keep clean. Therefore, pastels were used for day gowns. During the winter, heavier cloths, such as velvet or wool or even cotton was used. It was not uncommon for a woman to wear flannel petticoats during the colder months. Women no longer wore wigs or powdered their hair; yet, very conservative women still sported a mob cap at home. No respectable woman would leave home without a bonnet. Gloves were always worn outdoors, but they were also required for a lady during a ball or a social call. One removed her gloves for dining. As dresses had no pockets, reticules, a small material bag that closed with a pull string, were worn about one’s wrist. A lady would carry a parasol when riding with her gentleman friend to protect her skin from the sun. 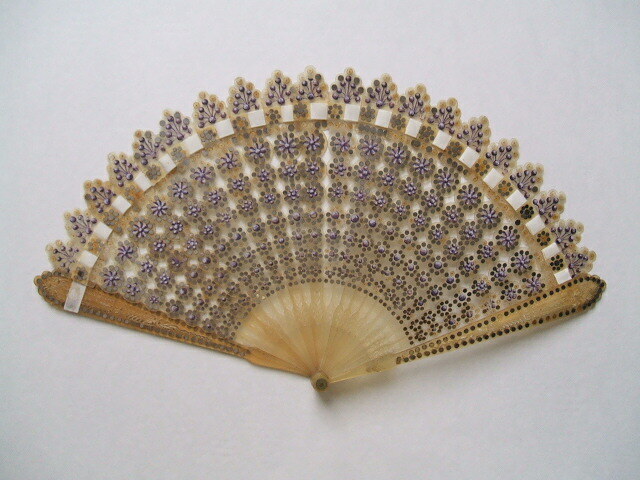 Decorative fans were also seen as an important accessory for the well dressed female. Early on in the 1800s, female garments were decorated with Greek symbols and patterns at the hem, around the neckline, or as a trim for the sleeve. More ornate trims were exported from France. The Empress Josephine remained a fashion icon through the early 1800s. Egyptian symbols and marking replaced those of the Greek line. With the onset of the Napoleonic Wars, frogging, braids, and cording were seen on both the male and female form. By the later years of the Regency Period, the bodice of the dress had more support and gave the female form a broader shoulder line. Flounces and padded rolls were added to the line. Some influences from the Elizabethan and the Tudor periods crept into the trim and pleated forms. By 1820, the Empire line had disappeared, instead taking on a more Gothic line, which lasted until Queen Victoria’s accession to the throne. The Spencer was worn both indoors and out. It was made of silk or wool (kerseymere). As an indoor garment, the Spencer was called a canezou. 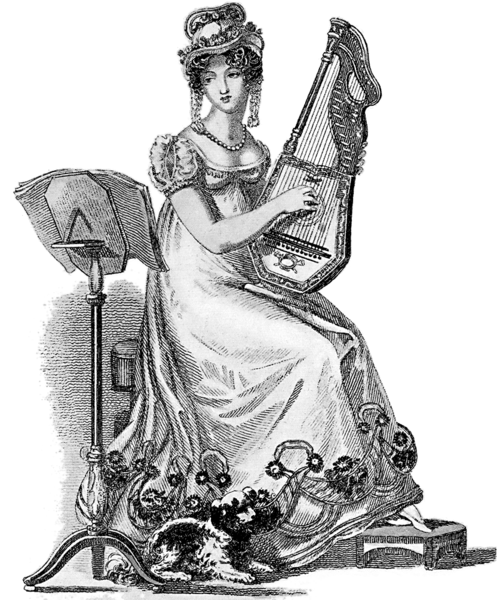 As with the Regency gown, the Spencer knew its share of trimming and decorative touches. 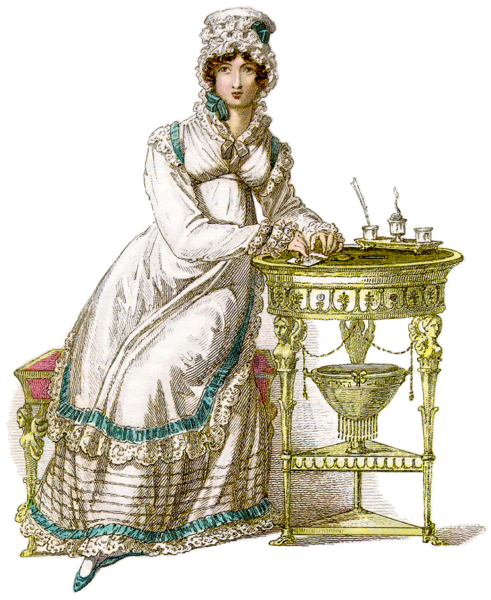 From 1800 to 1810, to keep warm, women wore pelisses over their gowns. It was an empire line coat that reached the woman’s hip or knee. After 1810, the pelisse was longer and heavier, with full sleeves. High- waisted like the Empire gown, the pelisse frequently sported a fur collar for additional warmth. Normally, the pelisse was brown or dark blue. A woman’s underwear lacked the touches of “Victoria’s Secret.” A chemisette, which was a side opening half blouse, filled in the woman’s bare neckline by day. Because the gowns were so thin, stays were avoided unless the figure demanded it. So, there you have it- A wonderfully compact guide to women’s fashion and dress in the Regency. Thank you to Regina for writing this post for me and in the future as I research women’s Regency fashion & dress more I will definitely be expanding on this most interesting topic! Thanks for hosting me, Philipa. Interesting information. Thank you, Regina. I find it hard to envisage how something like the pantaloons were considered slimmers when they must have been thick around the waist fastenings! What concise description of the Regency woman’s clothing. It makes the dresses come alive. Nice job. Wonderful post about an interesting subject!